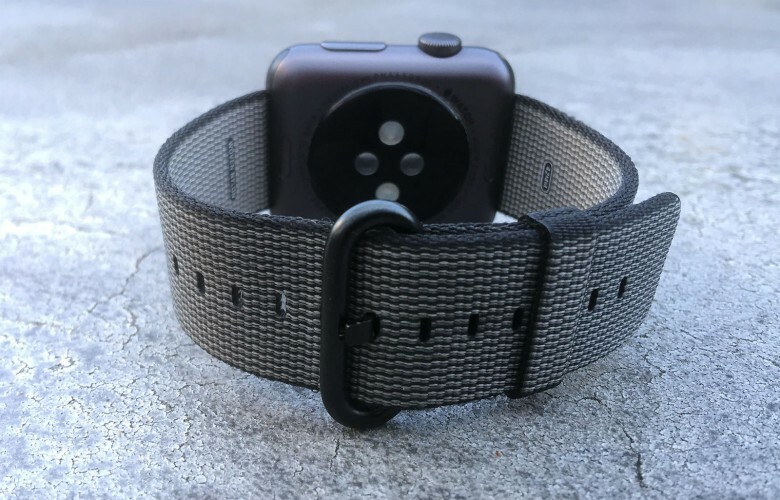 The woven-nylon Apple Watch band is a winner. If you’ve ever ordered anything online, you’ve probably experienced delayed dissatisfaction. You wait for the product, it finally arrives, you rip it open — and it’s nothing like the picture you saw on Amazon, eBay or whatever. The item is smaller, the color is crappier, the quality’s just not there. The new woven-nylon Apple Watch bands are similar — but opposite! They look even better than they do on the Apple website. And, despite what you might think about nylon as a watchband material, Apple’s latest accessories pack a premium punch. I didn’t expect this result. In all honesty, I didn’t really even want a woven-nylon watchband for my space gray Apple Watch Sport. I’ve been wearing the smartwatch for nearly a year now, and I’ve come to love it. Catch me in jeans and a T-shirt, and you’d probably guess I’d be the last person to buy into Apple’s newfound infatuation with fashion (and you’d probably be right). But even I have to admit that Jony Ive and Angela Ahrendts are onto something with the array of straps they are rolling out to keep Apple Watch owners on an endless upgrade cycle. I’m no fashionista, but I’m certainly no Johnny Cash, either. After a year wearing the stock black Sport band, I was more than ready to give the black-on-black combo a rest. I ordered the black woven-nylon Apple Watch band as soon as it became available. I know it says black right in the product name, but really it’s more charcoal with black accents — it’s a definite change from the rubbery black band I’ve been wearing all along. I placed the order despite the somewhat brassy look of the nylon bands on Apple’s website. I thought about adding a little color this time — after all, the new nylon bands aren’t nearly as eye-popping as their florescent Sport forbears — but the space gray hardware on the black nylon band matches my watch’s case. I wasn’t expecting much out of the woven-nylon watchband. It’s nylon after all — not exactly a material I think of as high-end. I expected something slightly flimsy and bordering on garish, especially since all I had to go on was the hyper-real images on Apple’s website. The band I received is anything but garish. It’s thicker than I expected and yet it’s still extremely flexible. Better yet, the material has not gotten hideously warped after more than a week of wear. I’ve seen leather Apple Watch bands made by dubious third parties that get far more distorted after just a weekend on Leander’s wrist. The nylon band’s hardware is solid and well-crafted, just as you would expect from an Apple product. However, it’s not as magically different as the Sport band, which is made of surprisingly skinlike fluoroelastomer. If you’ve gotten used to the Sport band’s shockingly simple pin-and-tuck closure, the more traditional nylon band might seem slightly trickier to get on and off of your wrist. But after a few bleary-eyed mornings struggling with it, it’s not a problem. The truly amazing thing is how subtle and refined the black woven-nylon Apple Watch band looks. It’s not nearly as obnoxiously bright Apple’s marketing images make you think (and neither are the other colors when you see them in person). I’ve gotten complements on it, and at least one person mistook it for some sort of woven metal band. It looks that substantial. It feels good, too — lightweight and perfect for the impending summer. When you get it wet, it darkens (which might get a bit weird on really sweaty summer days), but it also dries quite quickly. Aside from forcing my pea brain to remember how to close a traditional watch band, the only other real downside to the woven-nylon Apple Watch band is its price. At $49, it’s not exactly cheap. But this is definitely a “you get what you pay for” situation. They nylon band is truly comfortable and, after two weeks of daily wear, it looks as crisp as the day it arrived. Am I saying there’s no cheaper, third-party knockoff band available? No I am not. Do I know if it will last the summer looking just as sharp as it did when I first strapped it on? No I do not. But this is definitely a premium product. And, hey, you’re probably used to paying the Apple tax anyway, right? Learn about more lust-worthy products.